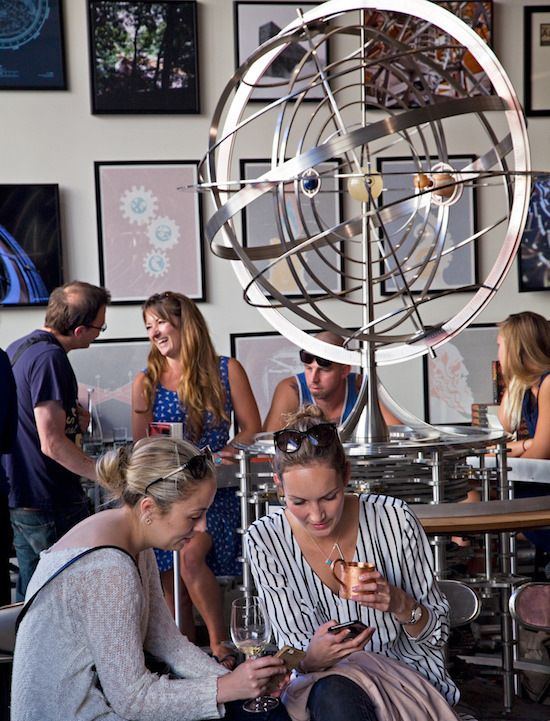 As visitors to Fort Mason amble past The Interval, the Long Now Foundation’s cafe-bar-museum-venue space, some are drawn, as if by gravitational pull, to an unusual eight foot-tall stainless steel technological curiosity they glimpse through the glass doors. Metal gears sit stacked one on top of the other to form a tower, with geneva wheels jutting out like staircase steps. Halfway up, the structure blooms into a globe of crisscrossing rings of metal, with seven orbs of differing color and size strung along them. It is the Long Now Orrery, a twenty-first century interpretation of an ancient device that tracks the relative position of the six planets visible to the naked eye (Mercury through Saturn) as they make their way around the sun. Orreries came in vogue in Europe during the Age of Enlightenment, where they were deployed as aids to teach a largely non-scientific public about the new heliocentric universe being revealed by the Scientific Revolution. After centuries of believing the Earth was the static, privileged center of the universe, orreries helped the European imagination re-calibrate to a bigger here and a longer now. The Orrery at the Interval has much the same role. It is both a mechanism and an icon. 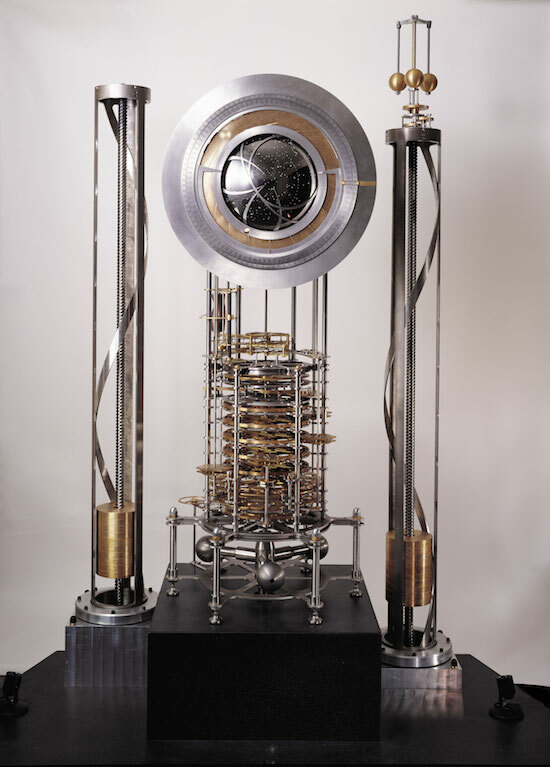 As a mechanism, it functions as the first working prototype of an orrery that will help the 10,000 Year Clock tell time through the millennia. The one in the clock will be four times as large. 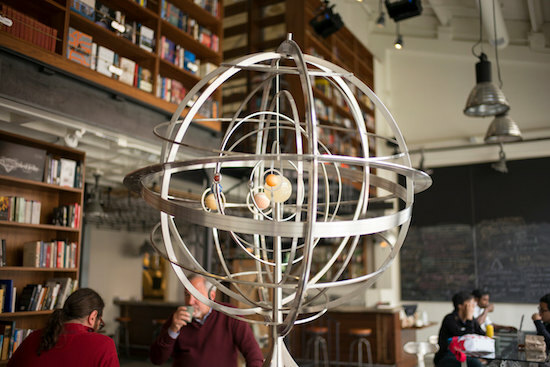 As an icon, the Orrery draws people into the orbit of long-term thinking and opens up a space for conversations about our place in the universe. The Ptolemaic understanding of the universe, with the Earth stationary at the center. By Cellarius, Harmonia Macrocosmical, (01660). It is clear, then, that the earth must be at center and immovable. It was something of an open secret in seventeenth century European astronomy circles: the Earth revolved around the sun. The notion was not without historical precedent. 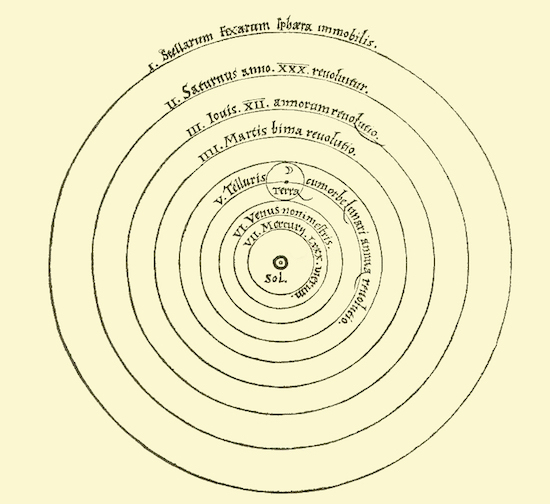 In 01514, when Nicolaus Copernicus began privately circulating his theory on planetary motion, he cited the Greek astronomer Aristarchus of Samos, who proposed a heliocentric model of the universe in the third century BCE. 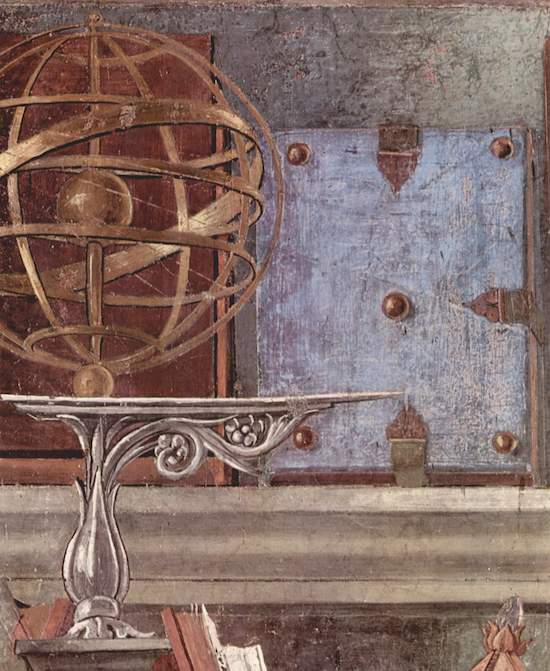 An armillary sphere in a painting by Florentine Italian artist Sandro Botticelli, (c. 01480). Via Wikipedia. But in the context of early modern Europe, the implications were profound, and appeared to contradict both common sense and the Bible. Since the time of Ptolemy (ca. 150 AD), the West conceived of the cosmos in anthropocentric and geocentric terms. 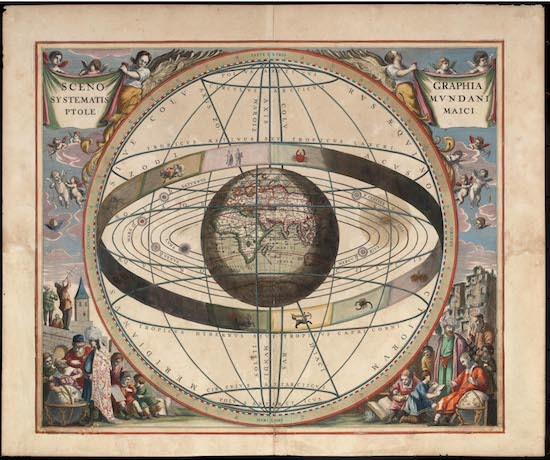 This cosmographic understanding was reflected in calendars, maps and the armillary sphere, an ornate physical model of the cosmos consisting of a spherical framework of rings that mapped celestial longitude and latitude from the Earth’s perspective. A drawing by Nicolaus Copernicus of the heliocentric model of the Solar System with the Earth revolving around the Sun. From his On The Revolutions of The Heavenly Spheres (01543). Now, in the model put forth by Copernicus, the Earth was reduced to a mere point in a sun-centered universe, no more special than its celestial neighbors. Anticipating the upheavals his ideas would bring about, Copernicus delayed publishing On the Revolutions of the Heavenly Spheres until 01543, the year after his death and the year most historians point to as the start of the Scientific Revolution. Galileo’s discovery of the four moons of Jupiter using the newly invented telescope in January 01610 proved that the solar system contained celestial bodies that did not orbit Earth. And Newton’s theories of universal gravity and gravitational attraction, first proposed in 01687, explained why planets orbit along elliptical trajectories—something first inferred by the German astronomer Johannes Kepler in 01609. But it would take more than observation and theory for Europeans at large to shake the notion that the Earth was not the center of the universe. It would take the orrery. An orrery of John Rowley. Detail of an engraving from The Universal Magazine (01749). O! pray! move on, Sir, said she, this is amazingly fine: I fancy myself travelling along with that little Earth in its course round the gilded Sun, as I know I am in reality with that on which I stand, round the real one. Astronomers and scientists began constructing orreries to get celestial bearings in this new Copernican universe. 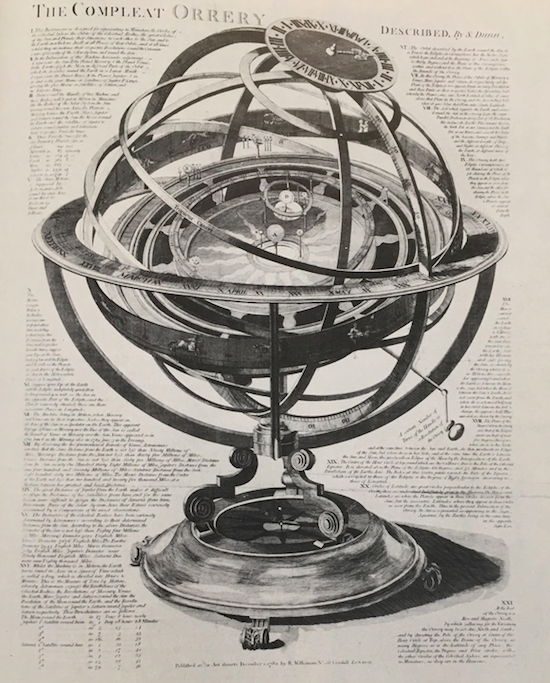 The orrery built on the armillary sphere, but with a Copernican twist: viewers would not only be able to see this new universe in miniature; they’d be able to track the movements of its planets over time. The Creator’s disengagement from an active presence was implicit in the new cosmology, and had profound implications for global images and meanings. Unlike the armillary, the orrery’s meaning lies in motion: inert matter is driven by forces that once set in motion continue to operate independently as the variously sized spheres revolve at divergent speeds. 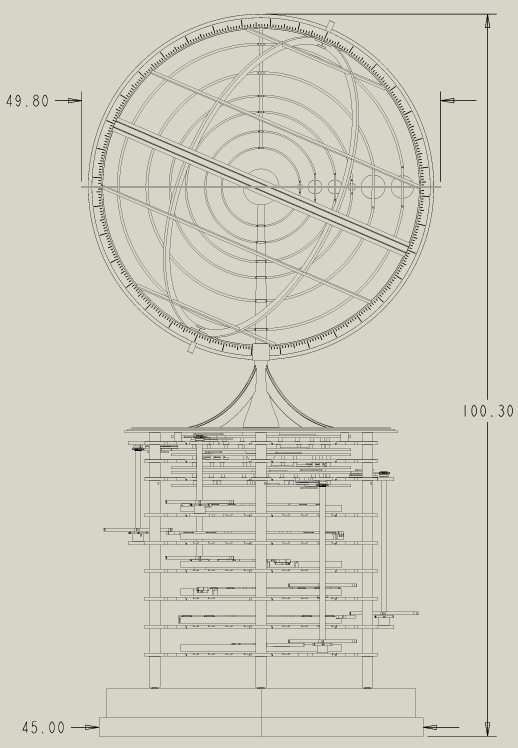 George Graham’s orrery and its mechanism, constructed sometime between 01704-01709. Via Museum of the History of Science, Oxford. 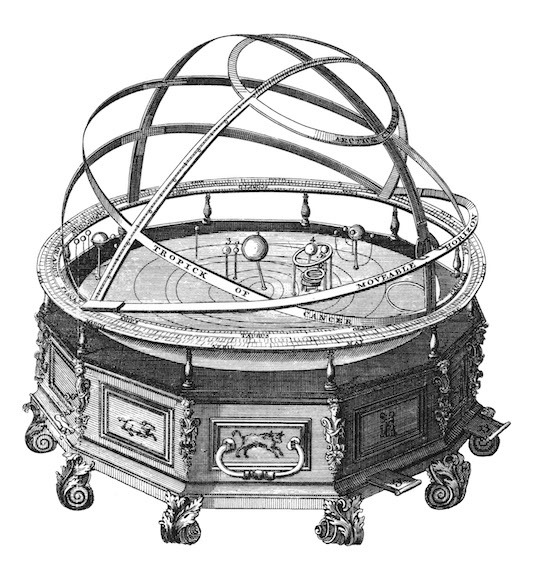 The credit for inventing the first modern orrery is disputed. The device would not answer to the name until famed inventor John Rowley presented one to Charles Boyle, the Fourth Earl of Orrery, in 01713. 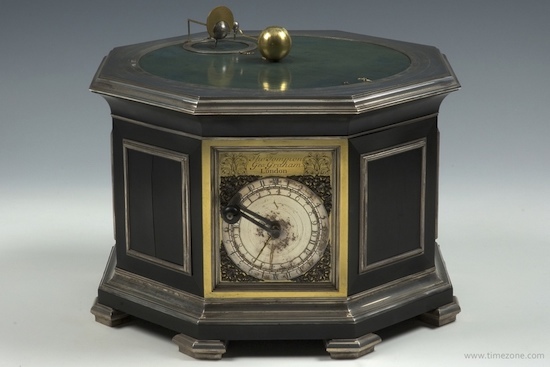 Rowley — and, more rarely, Orrery himself — is sometimes credited as the orrery’s inventor, but Rowley based his model’s design on a proto-orrery created in 01704 by English clockmakers George Graham and Thomas Tompion. Graham and Tompion’s model was simple, displaying only the Earth and its orbiting moon as it made its way across the sun. 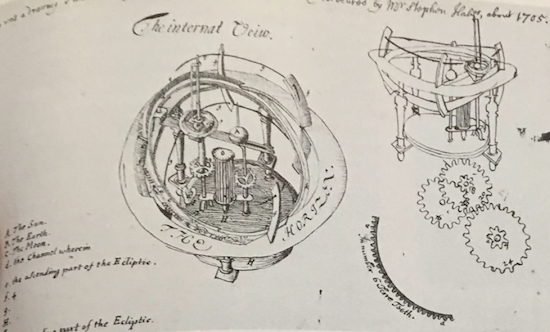 Stukeley’s drawing of Hales’ orrery. It bears the inscription: ‘This was a drawing I made at CCCC from a machine invented and executed by Mr. Stephen Hales, about 1705.’ Via Geared to the Stars (01978). about the year whilst I resided in Bennet Coll. [Chorpus Christi] where Dr. Hale [sic] was then fellow, at his request I made a drawing, which I had still by me, of a planetarium made by Dr. Hale. It was a machine to shew the motion of the earth moon & planets, in the nre [nature] of what they have since made in London, by the name of Orrerys. Dr. Hales proposed to me that we shd make another, upon an improv’d design, but my father dying, whilst I was undergraduate, wh making my stay at college somewhat uncertain, the design was dropped. An animation of the 21 plates of Edward Quin’s 01830 atlas, which mapped the “Known World” from 2348 BCE to 01828. Via Slate. “The Compleat Orrery described by Mr. S. Dunn” (01780). Via Geared to the Stars (01978). Some of the best work went into machines made for kings, princes, and wealthy patrons, but towards the end of the eighteenth century in England public interest in Newtonian natural philosophy encouraged instrument-makers to consider a wider market for their products. Like Blaeu and Moxon of an earlier age, they found it worthwhile to make machines that sacrificed ornamentation, but not necessarily craftsmanship, for scientific excellence and educational merit. The study of astronomy no longer became the prerogative of a chosen few but was laid open to the understanding of any literate person, regardless of social and educational background. Orreries grew more popular and advanced as the Enlightenment swept Europe over the eighteenth century. They came to be seen as more than just a visual instruction in the new science; they were desirable possessions and icons of the scientific method. Most importantly, they succeeded in reorienting a largely non-scientific public to a perspective that could see the implications of Copernicanism as obvious, instead of radical. A Philosopher Lecturing on the Orrery (01766), by Joseph Wright. Via Wikipedia. 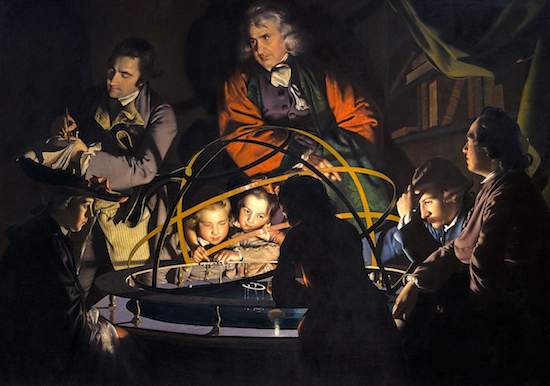 Joseph Wright of Derby’s A Philosopher Lecturing on the Orrery (01766) underscores the Enlightenment Age shift from traditional religious models towards ones based on reason and empirical observation. A domestic group of eight gathers round an orrery, its sun represented by a candle so illuminating that a man sitting to its right must shield his eyes. 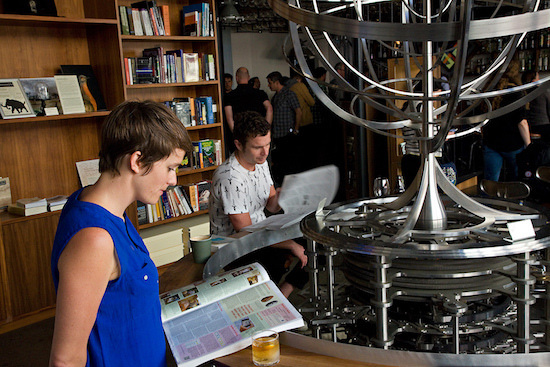 A scholar leans over the orrery, explaining its mechanics and underlying Newtonian principles. Breaking from artistic tradition, the faces of the two boys sitting at the orrery’s edge express the kind awe and wonder normally reserved for religious events and icons. According to the French academies of art, the highest genre of painting was history painting, which depicted Biblical or classical subjects to demonstrate a moral lesson. This high regard for history painting was adopted by the British. Wright took this noble, aggrandizing method of portraying events and applied it to a composition showing a contemporary subject in A Philosopher Lecturing at the Orrery. Rather than a moral of leadership or heroism, this painting’s “moral” is the pursuit of scientific knowledge. With its collection of non-idealized men, women, boys, and girls informally arranged in a small physical space around a central organizing point, Wright’s painting mimics the compositional structure of a conversation piece (an informal group portrait), but with the dramatic lighting and scale expected from a major religious scene. In effect, A Philosopher Lecturing at the Orrery does depict a moment of religious epiphany. The figures listening to the philosopher’s lecture in Wright’s painting are experiencing conversion…to science. The Orrery in Aughra’s observatory in The Dark Crystal (01982). Orreries eventually fell out of favor as the modern world developed and the Copernican perspective became the default way of understanding the world. Mechanical orreries are still being built, but they are more works of art than instruction aid. Today, few outside horology and cosmography would be familiar with the term “orrery,” though orreries have occasionally made pop culture cameos, notably in climactic, high stakes scenes in The Dark Crystal (01982) and Tomb Raider (02001). 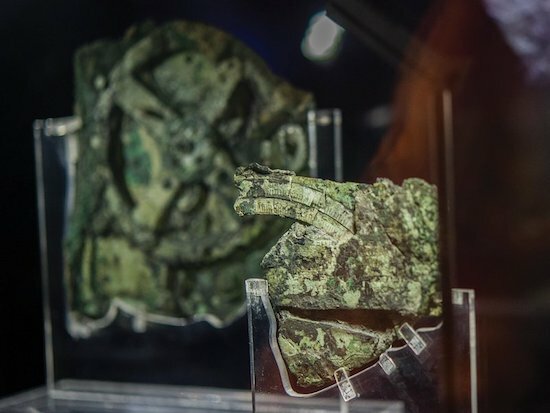 A fragment of the Antikythera mechanism. The scales on Fragment C divide the year by days and signs of the zodiac. Via Smithsonian. But orreries still have lessons to teach. The discovery of the Antikythera mechanism, a proto-orrery and analogue computer dating back to 200 BCE that displayed the diurnal motions of the Sun, Moon and the five known planets, has challenged our assumptions about antiquarian astronomy and technology. Found in a 01901 shipwreck off the Greek coast by sponge divers, the Antikythera mechanism mystified scholars until 02006, when advances in x-ray technology revealed a hidden differential gear — thought to be an eighteenth century invention. Despite their obscurity, orreries remain a useful tool to educate students about foundational ideas in astronomy. Human orreries have launched at a number of universities, where students play the role of the “planets,” and use their positions as modeled by the orrery to predict what they’ll see in the sky that night. Increased computing power has led to the advent of digital orreries for students to easily track planetary motion. In March 02017, war photographer Bassam Khabieh visited a school damaged by airstrikes in the rebel-held city of Douma in Syria. After six years of civil war, the country’s education system has been decimated. Teachers in ISIS territory risk their lives if they teach lessons that do not cohere to ISIS ideology. 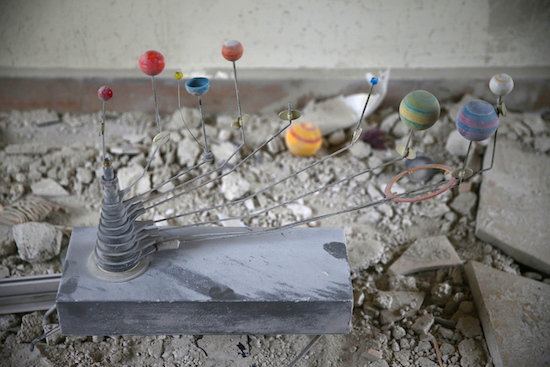 In one of Khabieh’s photographs, a damaged orrery stands amidst the dusty rubble, the plastic sphere of Earth dislodged from its mount. 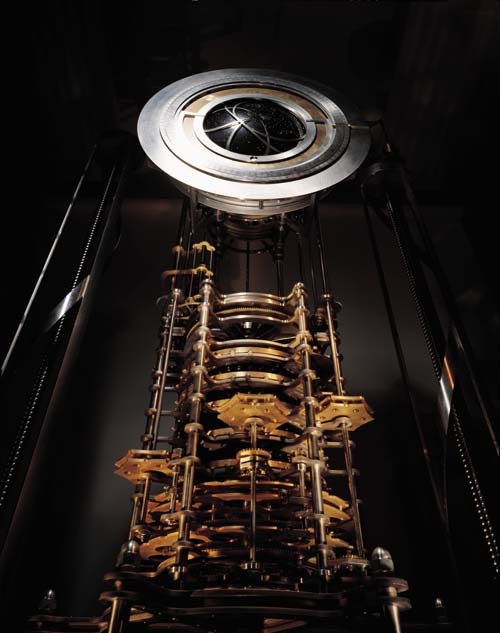 The First Prototype of the 10,000 Year Clock on display at the Science Museum in London. At Long Now Foundation we’ve always resisted the idea of turning the institution into a religion — even though religions may have the best track record for long-term endurance. But the comparison to monks devoting their lives to maintain a remote and long-lived clock is hard to avoid, especially if you show up at a momentous clock event in a hooded robe. 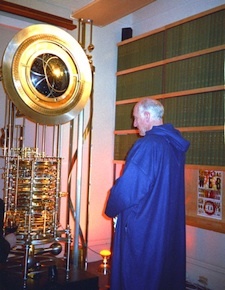 As the seconds ticked towards a new millennium, Long Now co-founder Stewart Brand stood contemplatively before the first prototype of the Clock of the Long Now in a hooded robe, waiting. On the left is Brand during his 01966 Whole Earth campaign. 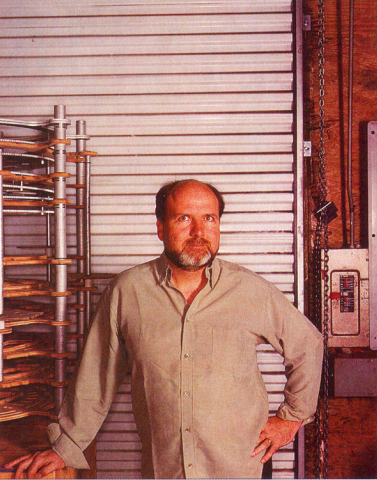 On the right, Brand stands before the first Clock prototype on New Year’s Eve, 01999. Thirty four years earlier, Brand mounted a successful campaign to have NASA release the first photographs of the whole earth from space. Now, on the eve of the millennium, Brand, Danny Hillis, Brian Eno and the Long Now Foundation were attempting to build something that would do for thinking about time what the photographs of the Earth did for thinking about the environment. “Such icons reframe the way people think,” Brand wrote in 01999. The Copernican revolution was secured through the circulation of cosmographic images that challenged ways of imagining and experiencing not only planetary arrangement and movement but the entire arrangement in which human existence was created and performed. Twentieth-century photographic images of the earth have stimulated equally profound changes in perceptions of society, self, and the world. Both sets of images demarcate key moments in the evolution of the ‘globalized’ earth. 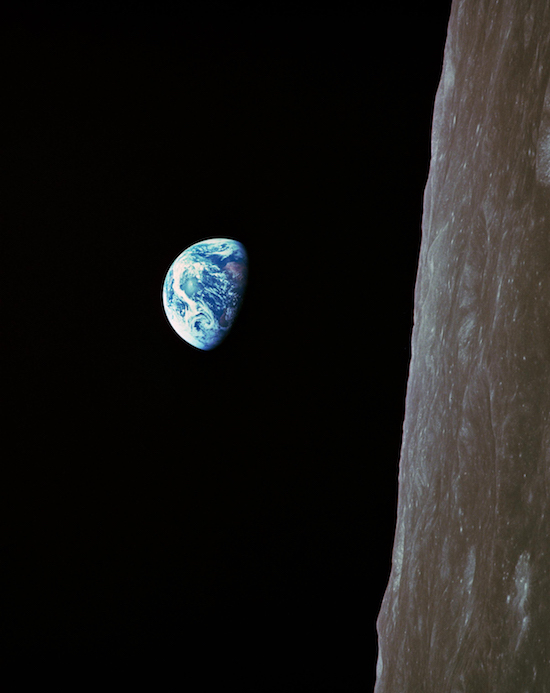 Earthrise, seen for the first time by human eyes, 24 December 01968. Via NASA. The first step to making an iconic clock is making a clock that works. The clock prototype was completed in a frenzied rush only hours before midnight, after three years of research and design. Brand, Hillis and some dozen others gathered in the offices of the Internet Archive in San Francisco’s Presidio district to see if it would tick. “It was a very strange scene,” Kevin Kelly recalled. A hush swept the room as the final seconds counted down. 3…2…1. Clicking gears whirred into place. And then: GONG! A chime rang in the new century. And: GONG! Another chime signaled the start of a new millennium. In the months that followed, Long Now presented the prototype at TED before installing it at the Science Museum in London. It was the culminating piece of the museum’s “Making of the Modern World” exhibit, which was opened by the Queen of England. The prototype remains there today on permanent loan. A wood-engraved frontispiece illustrating “a small portion of Mr Babbage’s Difference Engine,” (01872). Via Hordern House. Enter Nathan Myhrvold, then-CTO of Microsoft. 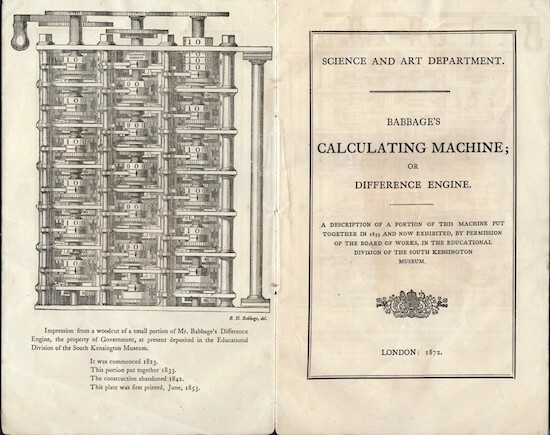 He was using a unique funding model to finance the Science Museum’s efforts to construct the difference engine that Charles Babbage designed in 01849 but, because of the limits of machine technology at the time, was not able to build. Myhrvold and the Science Museum agreed that if he were to fund the construction of two iterations of Babbage’s machine, he’d get to keep one. 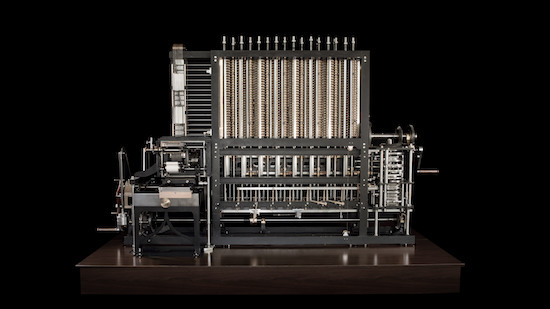 The Babbage Difference Engine, built by the Science Museum of London in 02002, 153 years after it was first designed. Via Computer History. 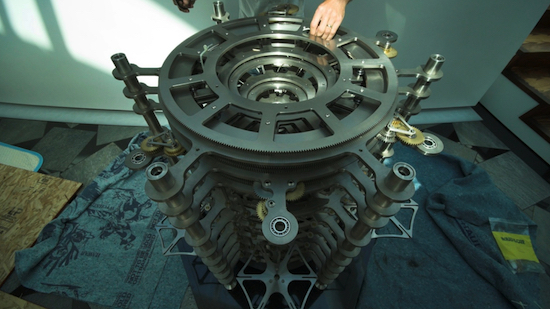 Myhrvold reached out and made the same deal with Long Now, financing its efforts towards building a second Clock prototype. At the time, Rose and Danny Hillis had only a notional idea as to what that prototype would be. Hillis decided that, rather than build a full clock, he’d design a part of the clock that would be the planetary display. Like the first prototype, such a device would require tackling unprecedented design problems raised by keeping track of, and lasting through, deep time. Unlike the first prototype, Long Now would get to keep a copy this time. “I love that thing,” says Francis Pedraza, an Interval regular, when I ask him about the Orrery over his afternoon tea. 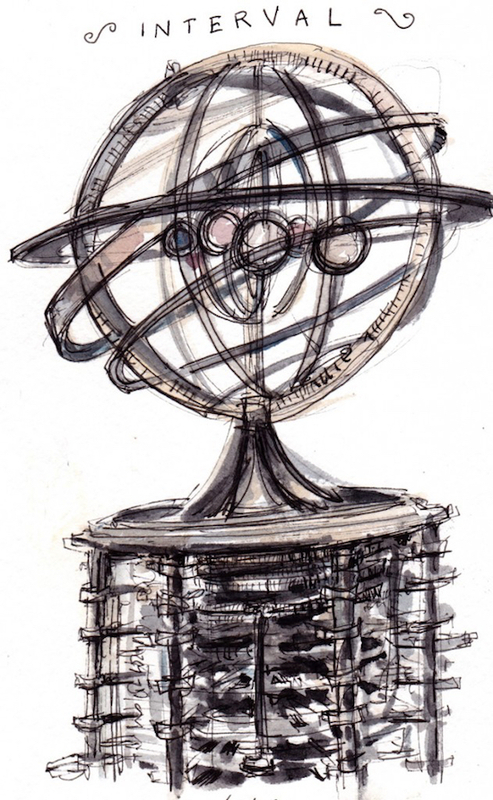 He’s never heard the term “orrery,” which he jots down in his notebook as soon as I mention it. But he has a good guess as to what it does. “Check it out,” Pedraza says, raising his left wrist to show me his Apple Watch. Its face displays a digital orrery of the solar system. A simple twist of the crown by Pedraza sends the planets scurrying forward or backward in time across their celestial trajectories, displaying effortlessly what took Early Modern European scientists painstaking precision to engineer. If Pedraza were so inclined, he could twist the crown to 10,000 years into the future (it would likely take a few hours). But with planned obsolescence baked in, Pedraza’s watch would be lucky to last another two years. The Long Now Orrery, on the other hand, must be a precise and durable computer for 10,000 years. 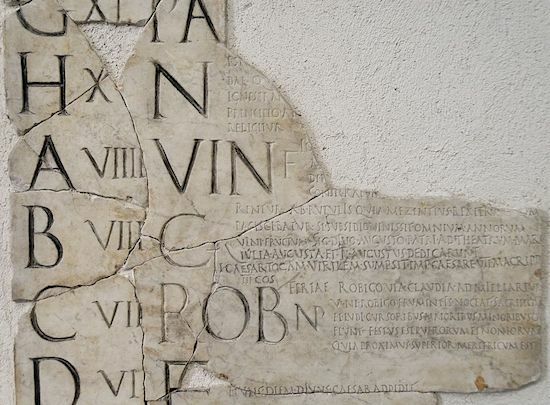 A fragment of a Roman nundinae for the month of April (Aprilis), showing its nundinal letters on the left side. Via Wikipedia. On its face, an orrery may seem an unlikely technology to depend on for the long term. But it makes sense when one considers how the way we’ve measured time has changed throughout history. It’s likely that our current use of hours, minutes, weeks and months may be as obscure and forgotten as the nundina, the akhet, or the gesh several millennia from now. The day, the year, and the movements of the other planets in our solar system, on the other hand, aren’t subject to the whims of those in power or passing cultural trends. The 10,000 Year Clock keeps track of these robust units of time. The Clock’s main dial keeps track of the Sun, Moon and stars while The Orrery models our solar system. 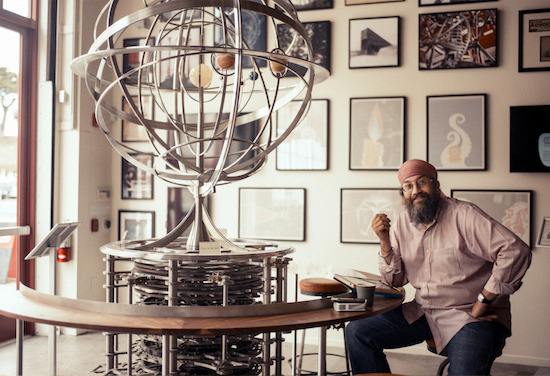 Danny Hillis, Long Now Co-Founder and designer of the Clock and Orrery. Via Discover Magazine. The prototype is designed to update each planet’s position twice a day, providing something of a kinetic sculpture of the Long Now as a time scale: Mercury completes one revolution in about 88 days; the Earth takes exactly one solar year; Saturn makes it around the Sun in just under thirty years. 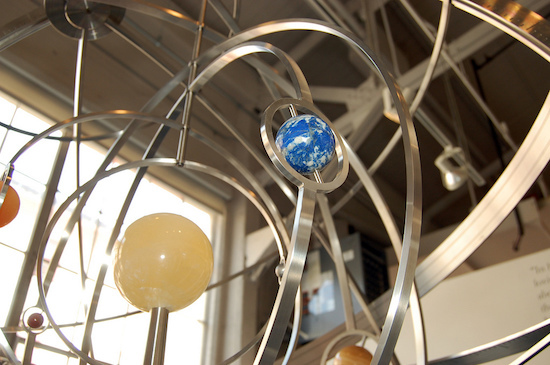 Each of the Orrery’s planets is ground from a stone that resembles the celestial body it represents. The Sun is made of yellow calcite; Mercury of meteorite; Venus of lemon yellow Mexican calcite; Earth of Chilean lapis; Mars of red Namibian Jasper; Jupiter of banded sandstone; and Saturn, of banded Utah onyx. 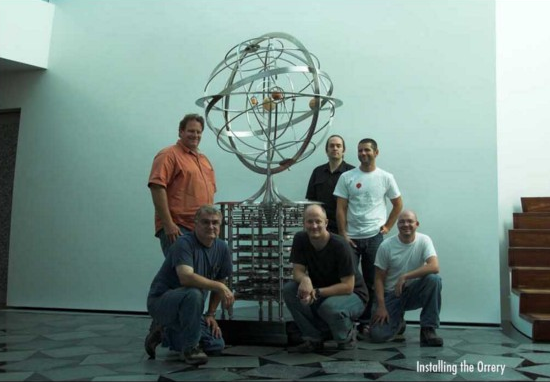 The Orrery was conceptualized by Danny Hillis, with project management and additional design by Alexander Rose. The lead engineer was Paolo Salvagione, and the lead machinist and fabricator was Christopher Rand. Other machinists included Erio Brown, Brian Roe, Mark Ribaud, Reason Bradley, General Precision, Oakland Machine Works, Jim Johnson, Brian Ford, Ebin Stromquist. The base was fabricated by Seattle Solstice. Most traditional clocks perform their mathematics in the orientation of gears around an axis. A gear measured this way can be in an infinite number and continuous number of states (an analog representation). The problem with building a 10,000 year clock using gears is that the gears can slowly wear down and slip, allowing inaccuracy to build up within the system over long periods of time. Even the best made clocks in the world will experience this after a few hundred years. To address this, Danny Hillis invented the Serial Bit Adder. The Serial Bit Adder is a simple mechanical binary computer that converts continuous motion from the gear (analog energy), into a digital output. The crucial mathematical logic for the bit adders is represented in the positions of the pins, which can only ever be in one of two states (digital), even if they become significantly worn. The bit adders calculate how much to move the planets in the display based on the known input of two rotations per day by the Orrery’s central shaft. As that shaft rotates it also turns the 6 bit adder disks: one for each planet. A bit adder consists of a rotating disk and two sets of 27 mechanical pins. Each individual pin can be in one of two states, and each set of pins taken altogether represents a 27 bit number. One set of pins is immovable — these are set based on the calculation that particular bit adder must perform; they are, in other words, the program. The other set of pins can move between the two possible states; they represent an accumulator. The Orrery’s base, featuring the serial bit adder. As the bit adder’s disk rotates, a portion of the disk reads the program from the unmoving bits and is moved by them. Its movements cause the other set of bits to be flipped as necessary. Each time the adder rotates, it adds the number encoded in the static pins into the number encoded by the moveable ones. That number is a fraction between zero and one. As the outer pins accumulate the value represented by the inner pins, their value grows towards one. When they surpass a value of one, the adder produces an output that adjusts its corresponding planet by way of engaging a 6-sided Geneva wheel. In this way, a precise ratio can be calculated based on the two daily rotations of the central shaft and applied to the planets in the display. 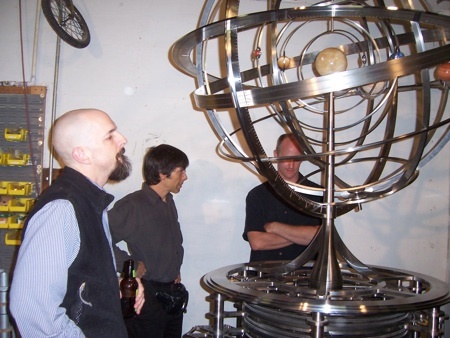 Author Neal Stephenson, who based his book Anathem (02008) partly on the 10,000 Year Clock, at the unveiling of the Orrery. 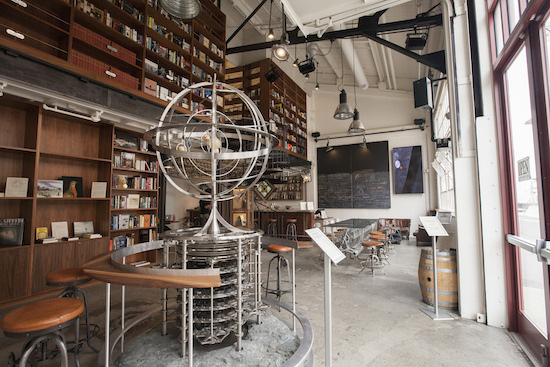 The Orrery was completed in 02005, and displayed at Long Now’s Fort Mason headquarters back when the space was a museum. 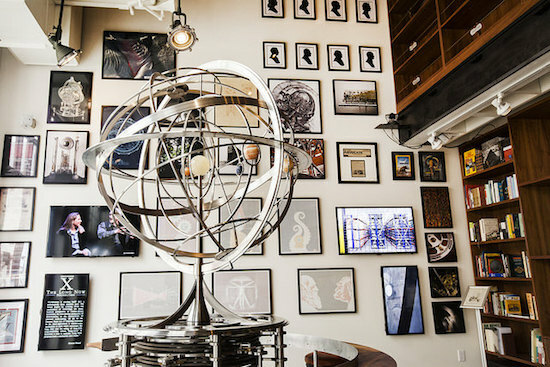 In the lead up to designing and building the Interval, Alexander Rose knew the Orrery would be crucial component from an experience design perspective. Back at The Interval, Pedraza brings up what, for some, is an uncomfortable truth: despite our post-Copernican knowledge that the Earth revolves around the Sun, many of us still maneuver through the world with the assumption that we are the center of the universe. We rarely think about this sort of natural, basic self-centeredness because it’s so socially repulsive. But it’s pretty much the same for all of us. It is our default setting, hard-wired into our boards at birth. Think about it: there is no experience you have had that you are not the absolute center of. The world as you experience it is there in front of YOU or behind YOU, to the left or right of YOU, on YOUR TV or YOUR monitor. Sketch by illustrator Dan Bransfield. He shows me a drawing of a human orrery orbited by different spheres of obligations, roles, and time considerations. Perhaps Pedraza is right. But that does not make the effort any less necessary. And the Orrery at the Interval — mechanism, icon, “shiny metal object” — is an essential component of that effort. It draws passers-by to the threshold of long-term thinking, inviting them to expand the orrery of their concerns to include not just the spheres of their immediate orbit, but the Earth as well; and not just for the present interval, but the next ten thousand years, too.